I still remember the “good old days” when gas cost $1.50 a gallon. Heck, if you went further back and looked at how much things cost in 1964 when many of us weren’t born yet, you’d probably think how nice and cheap prices were back then. But at that time, you’d be lucky to make $10,000 a year and more likely to make half of that amount. Why Do We Get Price Hikes? One of the most common reasons for prices increases is that the government raises our money supply or releases more currency in circulation, which then cause businesses to increase prices to maintain the same value for their products. High demand chasing low supply (or scarcity) can also cause price increases: when food items such as oranges or grapes are negatively affected by weather, then we see the consequences in our grocery stores. Higher interest rates can cause borrowing and the cost of doing business to become more expensive — we may see that cost passed on to general products and services. To be specific, a higher interest rate environment may be inflationary in the short term, but in the long term, rates are raised to counter inflation. Lower interest rates can spur growth and potentially inflation as well. How Much Did Things Cost in 1964? 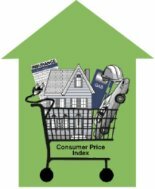 Today, with $9 or $10 for a movie ticket, property values in South Bend, Indiana at $126,000, Manhattan rents at $4,000 a month and Harvard tuition at over $31,000 a year, we have come to accept these price increases as part of everyday living, since after all, our median $53,350 a year salary is going to cover our expenses accordingly. In fact, we shouldn’t really complain too much with our inflation rates holding low for so long. So far, inflation has been tame in the United States, and we can thank the Federal Reserve hawks Ben Bernanke and Alan Greenspan for this. In fact, some mild inflation is actually considered a benefit by some economists and business people who believe it “greases the wheels of commerce”. The important thing is that it remains in check. 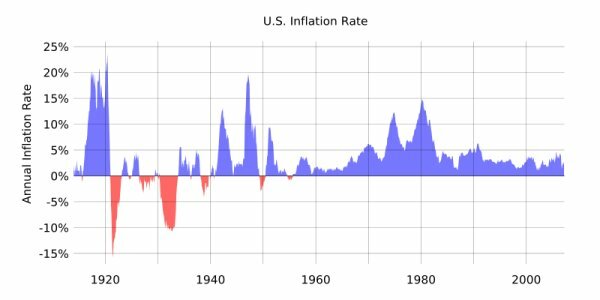 If you check out this U.S. historical inflation chart, we’ve never had more stable prices than we do today. Let’s just be thankful we don’t have to face runaway inflation (hyperinflation) as the Zimbabweans are doing at this point in time, where they are dealing with prices, incomes and money supplies that are out of control. Nor do we have to worry about deflation, which is the sustained fall in prices, typically triggered by a decrease in demand. That’s something the Fed keeps an eye on as well. In general though, by looking at this world inflation chart, it looks like we’re relatively in good shape. I discovered these cool calculators that shows us how our dollars have kept up with time: how does a certain dollar amount change from one year to another based on inflationary effects? You’ll find it with this tool. If you’re curious to see what the history of price is for a particular item from 1978 through today, here’s something you can review. I’m just surprised that bananas haven’t really changed in price much for the last 10 years, whereas other goods like eggs and milk have! More price index information here. Following is another illustration that shows you the percentage increase in prices for some common items we buy. In the span of a mere couple of decades, we see percentage rate increases from 55% for milk to 170% for your average house. What a difference 20 years makes! Though prices go up, we may not notice the increase when we get raises, relatively fatter salaries, and appreciated assets. When we see how everything else goes up, including our income, it isn’t as bad as it appears. Check out these customizable, historical inflation charts for the United States and the rest of the world. Before trying out a new entry, make sure you reset or clear out your previous entry for the graphs to work. Presently, U.S. inflation rates are a little over 2% while global inflation rates are even lower. Visit this web site and you’ll see a whole slew of information that touch on the value of old money, history, facts and figures that span the world. It contains a vast collection of money and currency data. In general, low inflation through the years is something we barely care about on a daily basis. Many of us get raises that keep up with the cost of living. But in the long term, these cost of living changes WILL matter. And it’s especially harder for people on fixed income. The good news, though, is that there are ways to combat the gradual degradation of your money’s value, but you’ll need to stay tuned for another post to continue this discussion. I hate to be picky on a great post, but higher interest rates counteract inflation. When you want to fight inflation, you raise rates. Price increases aren’t generally caused by higher rates. Great post, I long for the old days. I remember how those long sour strings were 5 cents each back in the 1990s. One other thing that can a cause a hike is monopoly. Whoever monopolizes a certain industry gets to enforce the prices they want. Great post! It doesn’t seem that long ago that gas was at $1.50 a gallon. It’s crazy what is happening in Zimbabwe now. Wikipedia is showing a reference that inflation in Zimbabwe has hit 7,634.8% in July of this year! Very interesting stuff, at the end of the day it’s all relative, as long as things are in balance everyone is happy. Looking at the historical average and being a bit more conservative we have assumed 4% inflation rate in our long term financial planning. Lets assume our target is to make a million dollars for our nest egg. We have figured that we would need a 6% average annualized return on our investments to reach that goal. Not so soon, we need to add another 4% to nullify the effect of inflation. That is we need an annualized return of 10% to retain the same purchasing power as $1 million in today’s value. Thanks for the clarification. Yes, I have added that it is short term inflationary when rates are raised, but the Feds raise rates to target/fight inflation. Higher rates are counter inflationary in the long term. @Fire Finance, I agree. I have an entire post lined up to discuss your points further ;). I would like to know how fast our income grew during that period of time. In fact, I don’t really mind paying 4% more on everything I buy years after years if my income increase by 5-6-7% over the same period of time. My dad was freaking out when I bought my first house for 250K. Back then, 250K was the price for a mansion! Wow, this is one of the best posts I have seen in a while. Obviously, you put a lot of work into this. Great information. Hey, nice post and great comments! There are some great ways to make money (or at least hedge) in inflationary periods. Oddly, some of these tools are even successful today in a mild inflationary period. I’ve been making a killing in commodities and with the dollar weakening, had hedged using a currency ETF which can be traded like a regular stock through any online broker. Today alone, several commodity stocks hit all time highs, plus nice yields to boot. Feel free to pop in to check out portfolio or recommend other inflation fighters! Anyone who does not believe this is clearly blind too and in denial of reality, physics, and true economic principals and most likely follows keynesian economics. The Dollar WILL collapse, and if you have any savings or business denominated in US dollars, you will be WIPED OUT. Oh, and by the way, the only reason why inflation seems to be relatively “acceptable” for the US is because we export excess Inflation to other countries to buy it up and speculate it to offset a lot of the effects of inflation. Otherwise, if it weren’t for all the offsetting of the dollar collapse and inflation manipulations, we would be swimming in dollars on the streets where we’d be scrambling trying to pile up wheelbarrows full of dollars only for a loaf of bread, like in the Weimar Republic. Just curious. Are you sitting on a bunch of gold and silver buried in your backyard or stowed away in your attic or basement? From what you’ve described, I am given this imagery of a survivalist hoarding food and metals in their underground shelter for some reason. 2010 isn’t too far away from now, and I am 100% certain this blog will still be happily up and running then, so I’ll revisit this post when that time rolls around and let you know if I’ve gotten wiped out. For the record, I don’t have a smattering of precious metals in my portfolio yet. I think I’ll buy in… with all of 5% of my portfolio. I guess you can call me a fool who is in denial of reality, physics, and true economic principles and one who (horrors!) most likely follows keynesian economics. Hello, I have recently been educating myself on the economy and my financial estate for just a year, I was another one of those ignorant people who goes with the flow, follows the masses. Not anymore thankfully, to get to my point I know I do not have near enough knowledge as any of you but I highly agree with Jason, from the knowledge that I have discovered, Gold and Silver are few of the only forms of protection against inflation, because it is “real money”. Also with the times we have coming ahead of us, I STRONGLY recommend having at the very least 10% of your portfolio in Silver and Gold, that way you will be at least protected. If you want to be one of the people come out on top of this “recession” I suggest having 25% or more in your portfolio. That percentage being 75% Silver and 25% Gold, as Silver is consumed and not hoarded like Gold. In 1971-1980 the price of Gold went up 24 itself and Silver 39 times itself!!!! in 9 years. I don’t know about you guys but I’m buying as much Silver and Gold as I can, no matter what the price! May I suggest watching “rich dad poor dad predictions 2008- part 4” on U tube. part 4 sumes it up very well, Robert Kiyosaki is one of the few leaders that i follow, all of them agree that Gold and Silver are a MUST! Increasing in money supply IS the technical term for inflation. Seeing prices increase is a cause of inflation. With the velocity of money currently low, you are not seeing any dramatic increase in pricing. It is assumed the Fed will take the punch bowl away before things start heating up and is a bad assumption. From an Austrian economic standpoint, the Fed certainly has not done a good job in the past 10 years. If anything, is one of the primary causes of the sub prime crisis. Since 1913 the dollar has lost 96% of it’s purchasing power,. We had a big decrease once we got off the gold standard (1970s) and then again starting in the early 2000’s. I know your data only has 2000 but if you take today goods how much have they increased since 2000?? The others I don’t have stats on, but since 2000 alone pricing has dramatically increased on past decade. The previous 30 years we’ve had 3.28% inflation (if you trust the Fed’s CPI). I think it’s pretty safe to say inflation for the next 30 years will be much higher for various reasons. Bring the good ol’ days back. Vote conservative. No, not Republican — I said conservative. Economic Growth Is Up. What Now?